The objective was to compare the radial strength and expansile precision of self-expanding stents and balloon-expandable stents in a human cadaver bifurcation model. Seven different self-expanding (LUMINEXX, JOSTENT SelfX, JOSTENT SelfX hrf, Sinus-Repo, Sinus SuperFlex, Easy Wallstent, SMART) and four different balloon-expandable stent models (Palmaz, Sinus Stent, SAXX Medium, JOSTENT peripheral), each type 10 stents (total n = 110 stents) were implanted into the common iliac arteries of human cadaver corpses. The maximum stent diameter was 10 mm for all models. After stent implantation, the specimens were filled with silicone caoutchouc. After 24 h, the vascular walls including the stents were removed from the hardened casts. Diameters were taken and the weight of the cast cylinders was measured in air and in purified water to calculate the volume of the bodies (according to Archimedes Law) as a relative but precise degree for the radial strength of the implanted stents. The cylindrical casts of the self-expanding stents showed lower mean diameters (8.2 ± 1.0 mm) and mean volumes (0.60 ± 0.14 ml/cm) than in the balloon-expandable stent group (10.1 ± 0.3 mm and 0.71 ± 0.04 ml/cm, respectively; p < 0.01). The nominal maximum diameter of 10 mm was not achieved in any of the self-expanding stents, but this was achieved in more than 70% (29/40) of the balloon-expandable stent specimens (p < 0.05). 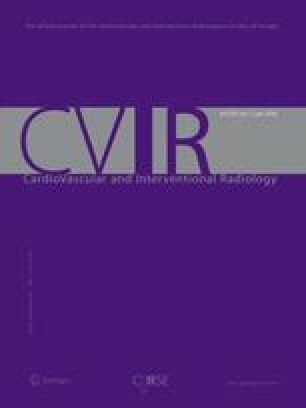 The variation between achieved volumes was significantly larger in self-expanding (range: 0.23–0.78 ml/cm) than in balloon-expandable stents (range: 0.66–0.81 ml/cm; p < 0.05). Self-expanding stents presented considerably lower radial expansion force and lower degree of precision than balloon-expandable stents.